Earlier this evening, I saw Latin Jazz singer Isaac Delgado with Freddy Cole at Yoshi’s Oakland. They were excellent. Delgado’s latest release, L-O-V-E, celebrates the music of Nat King Cole and features Freddy Cole on several songs. The great duo will be performing through Sunday. Yoshi’s Oakland and San Francisco have lots of great shows coming up including Geri Allen, McCoy Tyner, Charles Lloyd and George Wein and The Newport Jazz All-Stars. Take me to the water! The 34th Annual Russian River Jazz and Blues Festival is this weekend. Saturday’s Jazz lineup includes Spencer Day, David Sanborn, Joey DeFrancesco, Fourplay, Jeffrey Osborne, D’Giin, and Big Sam’s Funky Nation. Sunday’s Blues lineup includes Shane Dwight, Charlie Musselwhite, Jimmie Vaughn, The Doobie Brothers, Blues Defenders, and Mitch Woods and His Rocket 88′s. Be sure to bring your hat and sunscreen! Check out the performance schedule! Next weekend is the 53rd Annual Monterey Jazz Festival. Three days of jazz and other great music at the Monterey County Fairgrounds in Monterey, California. There are still great seats and single day passes available. Instead of posting every festival press release, here are the links to the most recent press releases. Check back here for any late breaking news or go the Monterey Jazz Festival website. You can also follow MJF on Facebook and Twitter. If you are heading north next weekend, there is the Vacaville Jazz Festival on Friday (9/17) thru Sunday (9/19). Legendary jazz pianist Ramsey Lewis will be performing for the Napa Valley Opera House Gala on Sunday, 9/19. Also, check out the great music from Sonoma Valley Jazz Society and Napa Valley Jazz Society. 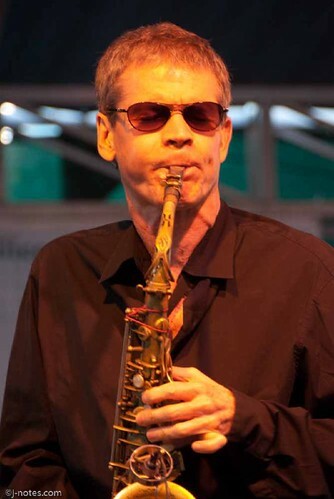 Photo of saxophonist David Sanborn at the 2008 San Jose Jazz Festival by James Knox. All rights reserved. This entry was posted on Saturday, September 11th, 2010 at 12:57 pm. It is filed under Jazz on the River, Monterey Jazz Festival, Music News/Info, Yoshi's and tagged with Charles Lloyd, David Sanborn, Fourplay, Freddy Cole, George Wein, Geri Allen, Isaac Delgado, Jazz on the River, Jeffery Osborne, Monterey Jazz Festival. You can follow any responses to this entry through the RSS 2.0 feed.